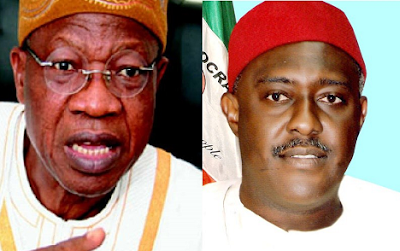 The N500 million libel suit filed by Lai Mohammed, the Minister of Information and Culture, against Olisa Metuh, a former Peoples Democratic Party, PDP, spokesperson, is set to proceed to trial at the Ikeja High Court. This followed the inability of the parties to reach an amicable settlement at the mediation court. The News Agency of Nigeria reports that Justice Oluwatoyin Ipaye had on April 27, 2016 ordered Mohammed and Metuh to settle their dispute at the mediation court. “Now that pleadings have been closed, seven days from today, please head to Alternative Dispute Resolution (ADR) Centre for mediation of this dispute,” Ipaye ruled. Confirming the development, a reliable source from the court’s registry told NAN on Friday that the case will now be assigned to a court for trial. Mr. Mohammed, a former spokesperson of the All Progressives Congress, APC, had on October 12, 2015, filed a suit against Mr. Metuh, accusing him of publishing libellous materials against him. Mr. Mohammed alleged that Metuh had falsely accused him of embezzling funds meant to build a fence at an airport in one of the Southwest states under the control of APC. The publication also alleged that Mr. Mohammed had obtained funds to supply ambulances to the Southwest states, but failed to do so. The minister is demanding a compensation of N500 million on account of the alleged false publication against him. The case is coming up before Justice Ipaye on November 3 for further directive.